The Fall 2018 issue of the NMA member magazine Driving Freedoms (“The Big Lie”) sounded a clarion call against the dismantling of established traffic engineering standards by the very agencies tasked with upholding those standards and protecting the public. Swept up in the Vision Zero dream of achieving zero road fatalities, the Federal Highway Administration (FHWA), the National Committee on Uniform Traffic Control Devices (NCUTCD), the National Transportation Safety Board and even the Institute of Transportation Engineers (ITE) appear to be acquiescing to special interest groups. This shirking of public responsibility is rooted in the oversimplification that slower traffic is automatically safer. Generalized proclamations can be suspect, particularly so in the engineering world. Before dispelling the “slower is better” mantra a bit later in this newsletter, the first order of business is a critical, time-sensitive call to action to you if we are going to protect reasonable speed limits. As encouraged in The Big Lie, of which you can find an abridged pdf version here, as many people as possible need to write to key transportation officials about protecting proven engineering standards such as the 85th percentile rule of establishing safe, efficient speed limits. Tom McCarey, a Pennsylvania member who is among the most active in NMA ranks in fighting for drivers’ rights, took heed and used information from The Big Lie to write to each transportation official listed later in this newsletter. He received this formal response from Thomas Heydel who chairs a key committee with the NCUTCD, showing that letters can be an effective way to get the message across to the right people. Officials from the ITE and PennDOT also wrote back with similar messages. Note that Mr. Heydel says that speed limits will be discussed at the January (9th to 11th) meetings of the NCUTCD. More letters like Tom’s are needed in order to force committee members to understand that there is a significant faction of people who are deeply concerned that practical speed limit considerations are being discarded in favor of a zero-death goal that, while noble, is unattainable no matter how many billions of taxpayer dollars are thrown at it. Tom’s letter is too lengthy to publish here but if you are planning to write to Heydel et al., contact us at nma@motorists.org and we’ll be happy to share some of Tom’s content with his blessing. We encourage you to borrow from The Big Lie as Tom did. We promised earlier to poke holes in the default view of Vision Zero followers that “slower is automatically safer,” the corollary to “speed kills.” There are many ways to do this, not the least of which is to use hard data from traffic speed distribution surveys, comparing safety numbers before and after speed limit increases. But don’t take our word for it; let’s look at statistics published by the FHWA itself. From 1975, the year after the 55 mph National Maximum Speed Limit went fully into effect, to 1994, the year before the NMSL was fully repealed, the annual traffic fatality rate on U.S. roads averaged 2.60 deaths per 100 million vehicle miles traveled (VMT). During the subsequent 20-year period of 1995 to 2014, as speed limits across the country rose 10, 20 and even 30 mph over the NMSL artificial limit, the fatality rate dropped more than 46 percent to an average of 1.39. And in 2017, the most recent data available from the government, that rate has fallen even further to 1.16 fatalities per 100 million VMT. To be sure, the dramatic drop of deaths on our nation’s highways in recent years is due to a number of factors including tremendous improvements in automobile safety technology, road design and emergency medical care. But it is willful ignorance to reject the notion that cars traveling more efficiently at optimum (85th percentile) speeds have also played a role in the dramatic decrease in road fatalities. 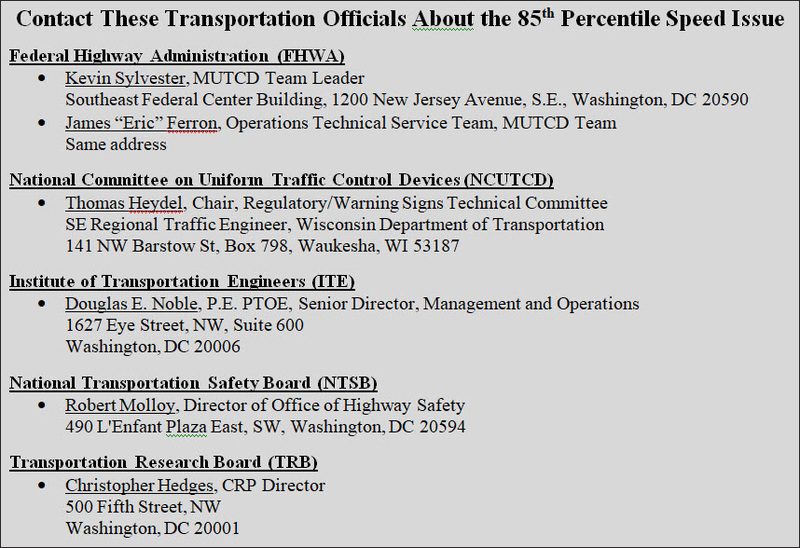 If you just have time to write to two people, make it James “Eric” Ferron of the FHWA and Thomas Heydel of the NCUTCD. Both have direct responsibilities with the Regulatory/Warning Signs Committee that in January will discuss speed limit guidelines going forward. It is critical they hear the collective voices of concerned drivers.